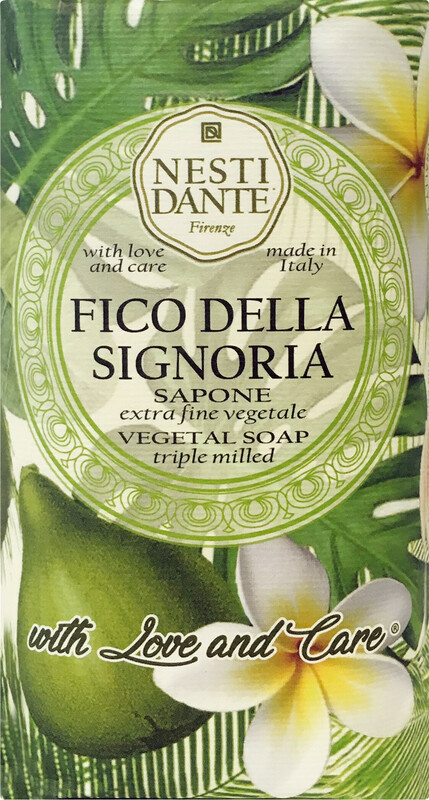 Delight in the beauty of the fig tree with the Nesti Dante With Love and Care Fico della Signoria Soap, a triple milled vegetal soap for the body. The fig fruit and leaves are celebrated in this kind-to-skin, cauldron blended soap. The invigorating scent of green fig is enhanced with warm, sensuous facets of frangipani petals to cocoon the body in a veil of uplifting, feminine charm. Enriched with a selection of rare and noble raw materials, this luxurious soap is made in Italy through the traditional process of saponification, which creates a rich and soft bar that holds its shape and intensely nourishes the skin.